Steve’s best political songs from the era of the Shrub, back when we thought George W. Bush was as low as a POTUS could get. 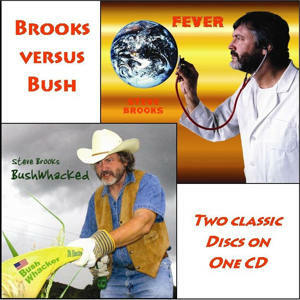 2 albums in 1, this CD collects songs from Steve’s antiwar EP Fever (2003) and his election-year EP Bushwhacked (2004). It moves from stiletto satire to the thought-provoking Normal No More and the rabble-rousing anthem The Terrorists Have Won. Best listened to before January 20, 2009.